This past weekend Brian, Natalie, and I flew to San Diego to attend WordCamp San Diego where Natalie and I were both speaking. Our flight landed at noon but the speaker dinner didn’t start until 6:00 pm, which meant we had some time to kill. After chowing down on Pei Wei, we decided to visit Mission San Diego and Old Town San Diego State Historic Park. Over the years, we’ve visited Mission Santa Clara, Mission Santa Barbara, Mission San Juan Bautista, the Carmel Mission, Mission Santa Ines, Mission San Buenaventura, Mission San Luis Obispo, and the Sonoma Mission. We’re slowly working our way through all 21 California missions. The spring is a fantastic time to visit Mission San Diego. The weather is gorgeous, the gardens are in bloom, and flowers in a variety of beautiful colors line the walkways. Our self-guided started in the Visitor Center and gift shop where we picked up an informational map, then we simply followed the points on the map, exploring the Mission grounds, wandering through the museum, and stopping in the chapel and the church. Mission San Diego was founded on July 16, 1769 by Father Junipero Serra. It was the first in the chain of 21 missions built in Alta or Upper California and is often referred to as the Mother of the Alta California Missions. It is also California’s first Mission Church, marking the birthplace of Christianity and Catholicism in the west coast of the United States. Today the Mission serves as an active parish church of the Roman Catholic Diocese of San Diego. Every year is it visited by people of all faiths who wish relive the grandeur and excitement of more than two centuries of California history and tradition. Father Junípero Serra arrived in San Diego on July 1, 1769 at nearly 56 years old and on July 16, he established Mission San Diego on a site overlooking the bay. However, water was insufficient, the ground wasn’t fertile, and the Indians were intimidated by the military, so five years later the Mission moved six miles east toward the San Diego River and the Kumeyaay village of Nipaguay. From 1769 to 1774, only 116 Indians had been baptized, but Father Jayme and the other Franciscan Missionaries built great rapport with the Kumeyaay and baptized 315 Indians during the summer of 1775. Unfortunately, two of the Diegueno Indians were dissatisfied with the Spanish regulations and incited a riot where 800 Indians stormed the mission, burned it to the ground, and massacred a blacksmith, a carpenter, and Father Jayme, who became California’s first Catholic Martyr. In 1776, Father Serra returned to Mission San Diego de Alcalá to oversee the rebuilding of the mission. Fearing future attacks, the mission was built within a 150 feet quadrangle, with nine foot tall adobe walls and military-style defensive structures. From 1778 to 1795 Mission San Diego became known as a horse and mule breeding farm, providing other missions in Alta and Baja California an average of 16 animals per year. San Diego would in turn receive farm products from the surplus of successful grain producing missions. And in 1797, 567 baptisms were performed. The mission land area encompassed about 55,000 acres, harvesting corn, wheat, barley, kidney beans and chick peas; vineyards produced enough grapes for wine and gardens yielded vegetables. Sometime after 1803, a dam was built across the San Diego River and from the dam, an aqueduct was constructed to carry water five miles west to the mission lands. By 1825 the mission owned 19,420 sheep, 184 goats, 8,120 cattle, 565 horses and 115 mules. In 1821, Mexico gained its independence from Spain yet the Mexican government did not have the same allegiance to the missions. The Decree of Confiscation of 1834 removed turned administration of Mission San Diego over to the Mexican government. In 1840, Pope Gregory XVI withdrew Alta and Baja California from the jurisdiction of the Diocese of Sonora, appointing Francisco Garcia Diego y Moreno, a native Mexican Franciscan, as the first Bishop of The Californias. Bishop Diego arrived in San Diego on December 11, 1841 but its poverty and insignificance drove him to relocate to Mission Santa Barbara in 1842 and in 1846, the lands of Mission San Diego de Alcalá were sold to prominent Californio Santiago Arguello. From 1848 to 1858, the United States Army occupied the mission grounds and made numerous modifications, including the conversion of the church into a two-story building, and the establishment of a military cemetery. Then in 1862, President Abraham Lincoln signed a proclamation returning Mission San Diego de Alcalá to the Catholic Church, but it was already in ruins. In 1891 Father Antonio Dominic Ubach began to restore the old Mission buildings and built two dormitories for a school. But upon his death in 1907, the school at the mission closed and all restoration work ceased. Finally, in 1931, with only the facade of Mission San Diego was still standing, reconstruction began to restore the Mission to what the architects believed it looked like in 1813. Ten years later, in 1941, the Mission once again became a parish church and in 1976, Pope Paul VI named Mission San Diego a basilica — a church of very important historical significance. Mission Basilica San Diego de Alcala is located at 10818 San Diego Mission Road, San Diego, California 92108 in San Diego County. 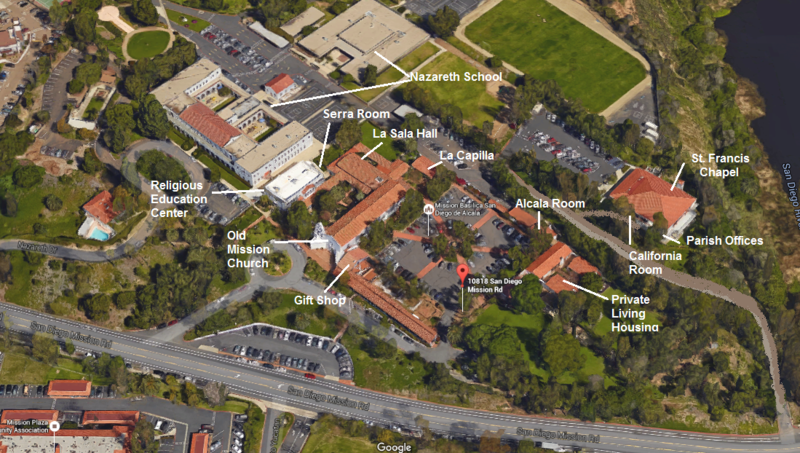 Get directions and view the campus map. The Visitor Center and Gift Shop is open daily from 9:00 am to 4:30 pm. Tours are self-guided, however, group tours are available by reservation only. The church you can visit today is the fifth church to be built on this site. Of the Mission’s five bells, only one (the one with a crown) is an original dating back to 1802. The olive in California was first cultivated at Mission San Diego and trees from San Diego furnished cuttings used to start olive orchards at other California missions. By 1834 Mission San Diego boasted one olive orchards with 300 trees and one with 167 trees. Mission San Diego was designated a California Historic Landmark in 1936, added to the National Register of Historic Places and designated a National Historic Landmark in 1970, and named a San Diego Historic Landmark in 1976. Only four California Missions are basilicas: Mission San Francisco de Asis, Mission San Carlos Borromeo, Mission San Diego, and Mission San Juan Capistrano. El Camino Real, the King’s Highway, begins in San Diego and ends 600 miles north at Mission San Francisco Solano in Sonoma. All 21 California Missions were built one day’s walk apart.